Learn how to make these supremely fudgy brownies from scratch! They’re just 73 calories with no refined flour or sugar, and they’re about as easy as a box mix to make! 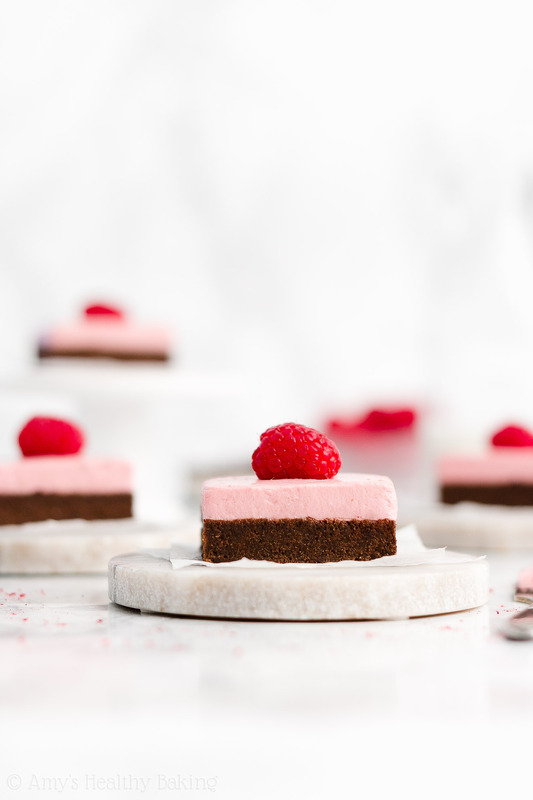 The creamy raspberry frosting adds the perfect finishing touch—and it contains no butter or powdered sugar! Last week, my mom mentioned that her company had scheduled a trip to Hawaii during the summer to visit one of the scientific projects they help fund, and the tour included enough spots for her to bring one guest. Since Dad had already planned a long backpacking trip with his buddies that particular week, she asked if my brother or I wanted to come with her. I immediately checked my calendar and wrote back 10 seconds later with an emphatic YES! The following evening, I called Mom, and she shared a few more details about the excursion and her travel plans. For the next few days, I daydreamed about my favorite Hawaii activities and restaurants. Our family has vacationed there around fifteen different times throughout my life, which meant plenty of memories floated through my mind during the day! At the top of my favorites list sat two places known for their desserts, a restaurant and a little ice cream shop called Lappert’s. We always stopped by the latter at least two or three times during our trips because it created some of the best ice cream we’ve ever tasted. The ice cream shop sold classic flavors like vanilla, chocolate, mint chip, and cookies ’n cream… But we usually gravitated towards the Hawaiian themed options: Auntie Lilikoi’s Passion Fruit sorbet; Kauai Pie, Kona coffee ice cream with coconut flakes, dark chocolate fudge, macadamia nuts, and vanilla cake crunch; Nēnē Tracks, vanilla ice cream with mini peanut butter cups, dark chocolate fudge, salted caramel, and chocolate covered honey roasted almonds, cashews, and peanuts; and Mauna Kea’s Secret, vanilla ice cream with fudgy brownie chunks and raspberry sorbet swirled throughout. As an incredibly indecisive person, I always had the hardest time picking out just one flavor to try, even though we visited the store multiple times… So I really appreciated how Lappert’s offered half-sized scoops, which meant I could order a half portion of two different flavors for the price (and size) of one normal scoop! Yet just about every time, I ended up ordering Mauna Kea’s Secret as one of my half scoops. That rich chocolate brownie paired with the fruity sorbet, all tied together in that sweet and creamy base… It took nearly all of my self control not to speed through and polish off that ice cream in record time! 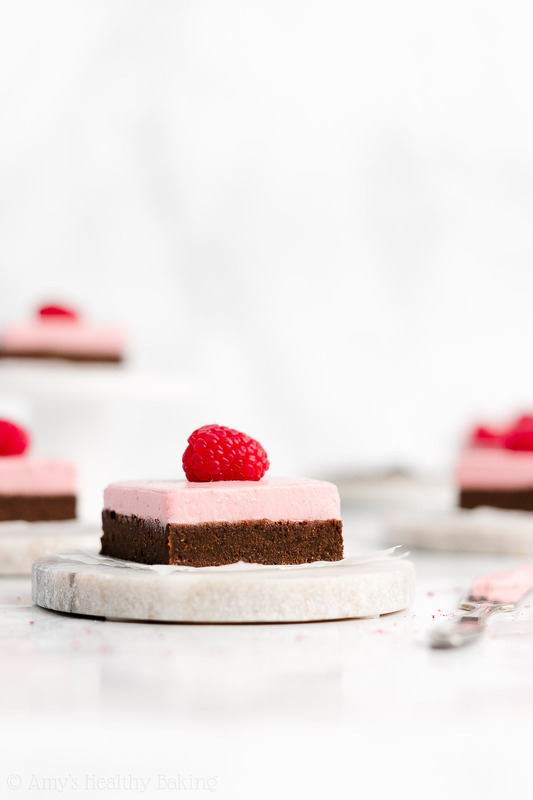 These Healthy Fudgy Dark Chocolate Brownies with Raspberry Frosting! 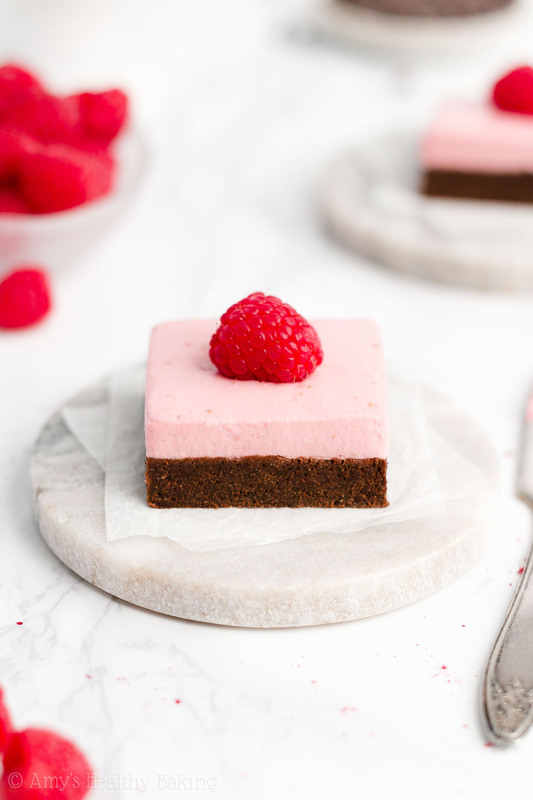 These brownies taste even richer and chocolatier than the chunks in those Lappert’s scoops, and this sweet frosting marries the flavors of the raspberry sorbet with the creaminess of the ice cream. 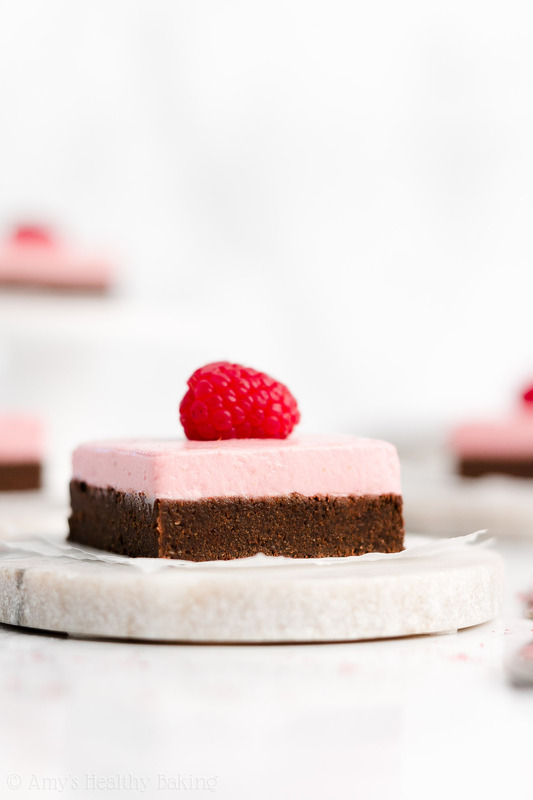 Yet unlike the Hawaiian ice cream, this dessert contains no refined flour or sugar and just 73 calories in each brownie! 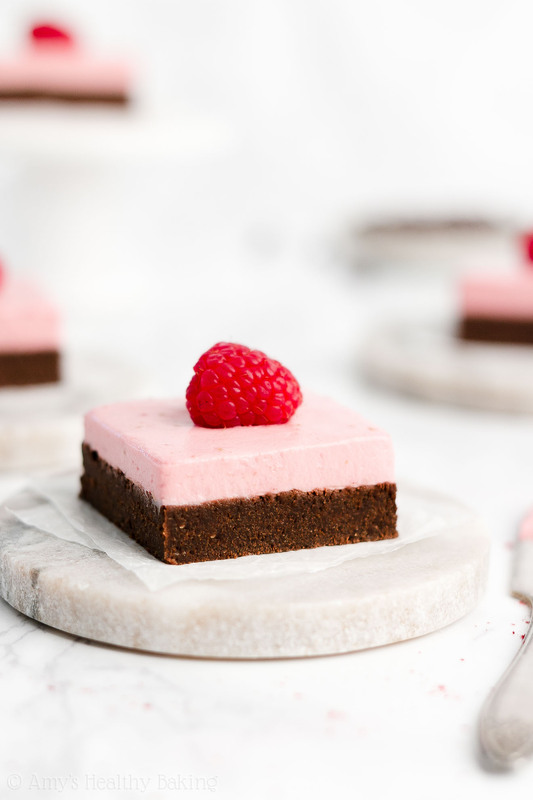 So let’s go over how to make these healthy fudgy dark chocolate brownies with raspberry frosting! You’ll start by making the brownies, which means you’ll whisk together equal amounts of white whole wheat flour and unsweetened cocoa powder. I highly recommend using regular unsweetened cocoa powder, like this! Despite their name, Dutched and “special dark” cocoa powders actually don’t taste nearly as rich, dark, and decadent as regular unsweetened cocoa powder. Their flavor is much more muted, so go with regular unsweetened cocoa powder for the best taste! Yet white whole wheat flour is made by finely grinding a special type of soft white wheat (hence the name! ), whereas regular whole wheat flour comes from a heartier variety of red wheat. They both have the same health benefits (like extra fiber! ), but white whole wheat flour has a lighter taste and texture. That lets the rich chocolate flavor and extra fudgy texture of your healthy brownies truly shine! Just remember, it’s extremely important to measure the flour and cocoa powder correctly, using this method or a kitchen scale. (← That’s the one I own and love!) Too much of either ingredient will make your brownie batter stiff and your brownies turn out dry. Too much cocoa powder will also make your brownies taste bitter instead of rich and decadent. So… I pinky swear promise these healthy fudgy dark chocolate brownies are worth the 10 extra seconds of measuring correctly! Whereas many traditional brownie recipes call for an entire stick or two of melted butter, you just need 1 tablespoon for this recipe. That eliminates anywhere from 713-1,530 calories! 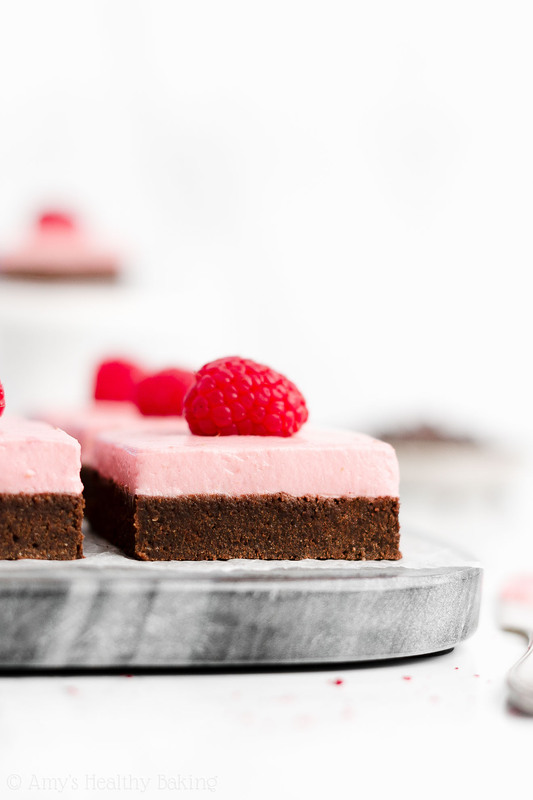 And that really helps keep your healthy fudgy dark chocolate brownies with raspberry frosting low fat and low calorie! Greek yogurt! Greek yogurt adds the same moisture to your brownie batter as extra butter or oil but for a fraction of the calories. 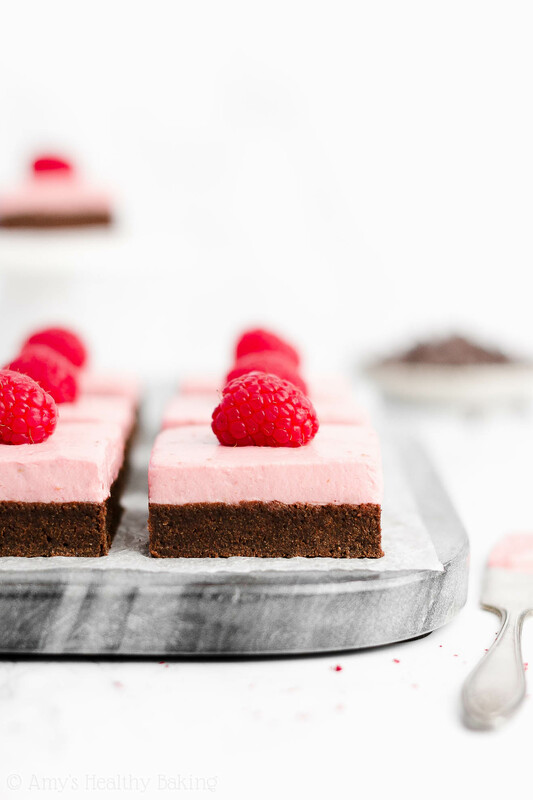 It also gives your healthy fudgy dark chocolate brownies with raspberry frosting a protein boost! Next, you’ll skip the refined granulated sugar and sweeten your brownies with coconut sugar instead. Coconut sugar is exactly what it sounds like: an unrefined sweetener that comes from coconuts. However, it does not actually taste like coconuts! It has a caramel-like flavor, similar to brown sugar. You can usually find it on the baking aisle right next to the granulated and brown sugars! Although I’ve been baking for over two decades (goodness, that makes me feel old! ), I just recently learned a trick for brownies from my friend Naomi. I saw her line her brownie pan with wax paper, just like you would when baking layer cakes. Once they finished baking, her brownies popped right out of the pan! Maybe you already knew this trick… But it comes in handy later! In the meantime, there are two other important things to mention about baking your healthy fudgy dark chocolate brownies! You’ll bake them at a somewhat low temperature, just 300°F. They only take about 15 minutes to bake! Secondly, your brownies are done baking when the sides look firm and fully baked through but the center still looks glossy and slightly underdone. You’ll let your brownies cool completely to room temperature in the pan, so the heat from the pan will continue to cook the center of your brownies without drying out or over-baking the edges. If the edges of your brownies start to pull away from the edges of your pan within 10 minutes of pulling them out of the oven, you’ve baked your brownies long enough! And finally… I know it feels like pure torture to wait, but you must let your brownies rest for 6+ hours once they’ve cooled to room temperature for the fudgiest texture imaginable. If you cut into them sooner, or while they’re still warm, they have a more dry and cakey texture. Letting them rest helps your healthy dark chocolate brownies turn even more fudgy! And while they rest, you can prepare the frosting! No butter or powdered sugar here… You actually start with more Greek yogurt! I’ve found that not all brands of Greek yogurt work the same in my Greek yogurt frosting recipes. Some are thinner and a little more watery than others. This brand is my favorite because it’s incredibly thick and creamy, which leads to incredibly thick and creamy Greek yogurt frosting! For the fruit flavor, you’ll actually use freeze dried raspberries! They’re the light, airy, somewhat crunchy ones—not like regular dried fruit! These are the ones I use. I’ve found freeze dried raspberries at Target and Trader Joe’s! Before adding them to the Greek yogurt, you’ll crush them into a fine powder. I used my coffee grinder to do this! A food processor or blender should work too. 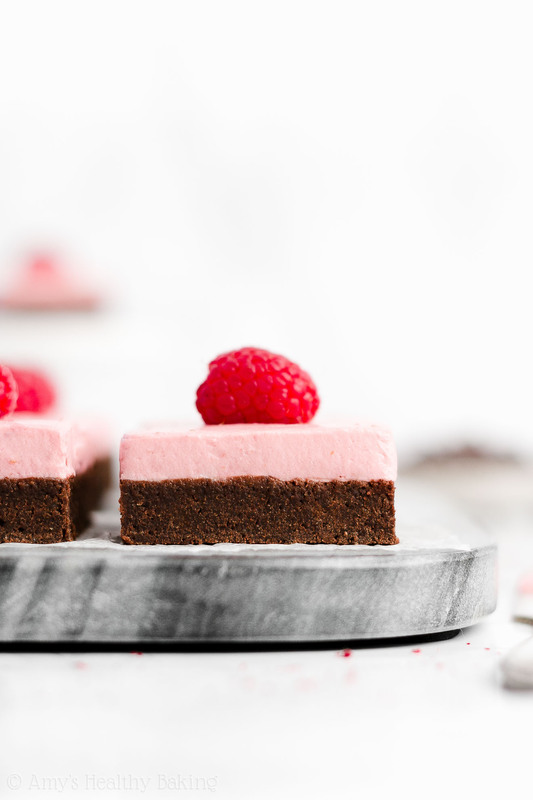 So… Now that your pan of healthy fudgy dark chocolate brownies has fully cooled and set, you can tip them out of your square baking pan and spread the healthy raspberry Greek yogurt frosting on top. How pretty is that frosting?? 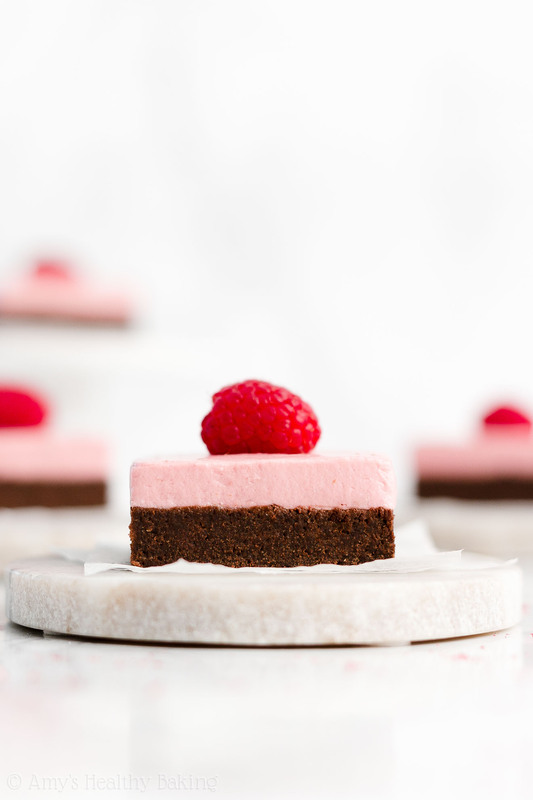 No food coloring here—that color is just from the raspberries! Remember how I said lining your pan with wax paper would come in handy later? That time is now! If you frost your brownies while they’re still in the pan, the frosting tends to smear all over the sides when you try to lift individual brownies out of the pan. But… If you frost your brownies after lifting them out of the pan, it’s much easier to slice them into squares without the frosting spreading down all over their sides as you pull your brownies apart. And that leads to really pretty brownies! Just a little trick for you! And when you make your own, remember to snap a picture and share it on Instagram using #amyshealthybaking and tagging @amyshealthybaking IN the photo itself! (That guarantees I’ll see your picture! 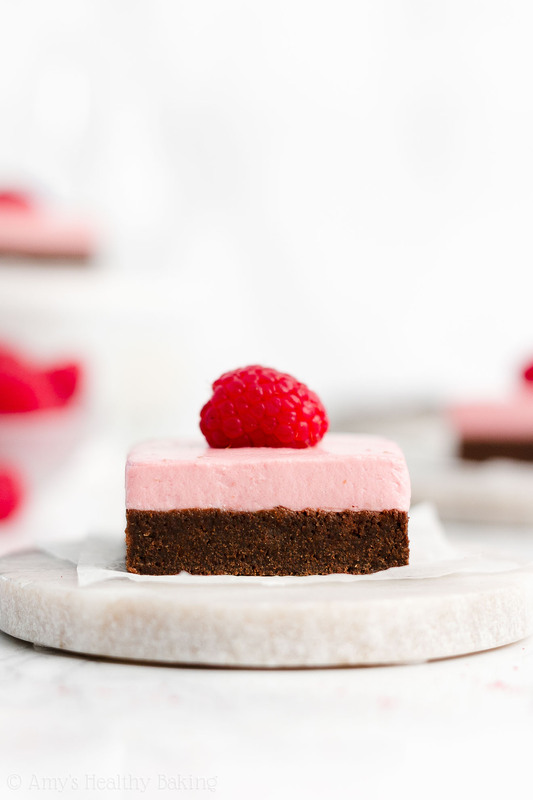 😊) I’d love to see your healthy fudgy dark chocolate brownies with raspberry frosting! These frosted brownies look and taste fancy, but they’re surprisingly simple to make! The brownies taste incredibly rich and decadent, similar to 72% dark chocolate, and they’re supremely moist and fudgy. 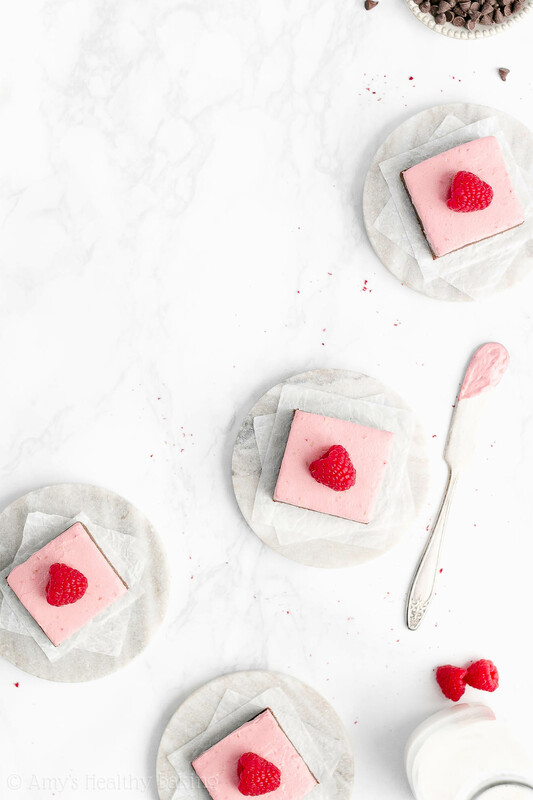 The sweet and creamy raspberry frosting is the perfect finishing touch, and its pink color looks so pretty too! The brownies are best if eaten the same day that they’re frosted, but leftovers will keep for at least four days (if not longer!) if stored in an airtight container in the refrigerator. To prepare the brownies, whisk together the flour, cocoa powder, baking powder, and salt in a medium bowl. In a separate bowl, whisk together the butter, egg whites, and vanilla. Stir in the Greek yogurt, mixing until no large lumps remain. Stir in the coconut sugar. Stir in the milk. Add in the flour mixture, stirring until just incorporated. Spread the batter into the prepared pan. Bake at 300°F for 15-19 minutes (15 minutes yields the fudgiest brownies; 19 minutes yields slightly cakier brownies). Cool completely to room temperature in the pan, and let the brownies sit for at least 6 hours once at room temperature for the fudgiest texture before frosting and serving. 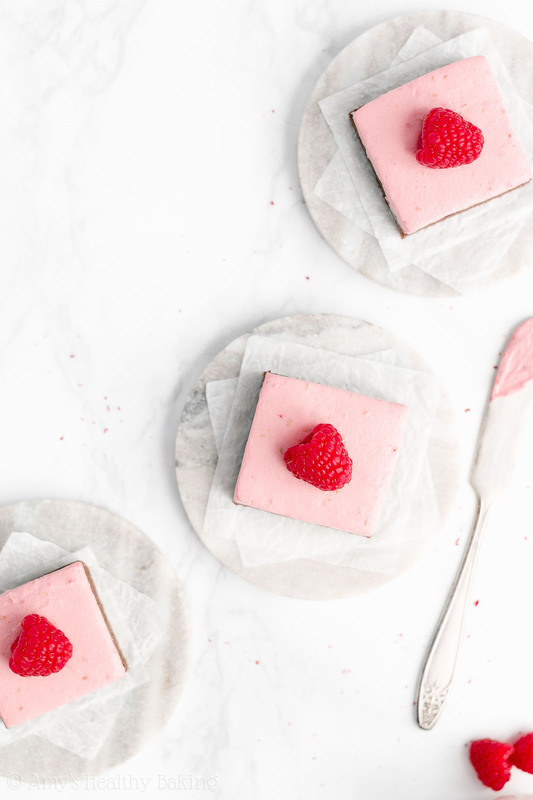 To prepare the frosting, add the freeze dried raspberries to a blender or coffee grinder, and pulse until they’re a fine powder. Add the raspberry powder, Greek yogurt, instant pudding, and liquid stevia to a large bowl. Beat with an electric mixer for 2 minutes. Cover the top of the bowl with foil, and refrigerate for at least 2 hours. Once the brownies have completely cooled and rested for 6 hours, spread the frosting on top just before serving. Notes: For the gluten-free flour, use as follows: ½ cup (60g) millet flour, 2 tablespoons (15g) brown rice flour, 2 tablespoons (15g) tapioca flour, and ½ teaspoon xanthan gum. Most store-bought gluten-free flour blends (like this one!) will work as well, if measured like this. Whole wheat pastry flour, regular whole wheat flour, or all-purpose flour may be substituted for the white whole wheat flour. Oat flour (gluten-free, if necessary!) may be substituted as well, but be extremely careful when measuring it! I don’t recommend using Dutched or special dark cocoa powder. The brownies already taste very rich and dark chocolaty without it! Make sure you measure the cocoa powder and flour correctly, using this method or a kitchen scale. (← That’s the one I own and love!) Too much will dry out your brownies and make them taste bitter. The brownie edges should look firm but the center should still look somewhat glossy and underdone when you remove the pan from the oven. If the edges of your brownies begin to pull away from the edges of your pan within 10 minutes of removing them from the oven, then you’ve baked them long enough! For the frosting, I’ve found that not all Greek yogurt brands are equally thick! This is my favorite one for my Greek yogurt frosting because it’s the thickest brand I’ve found, which means your raspberry frosting holds its shape so much better! This is the instant pudding mix that I used. You just need the dry instant pudding mix—don’t prepare it according to the package directions! You can omit it (for a clean eating option), but the frosting won’t be as thick, and you’ll probably need to spread it on the cupcakes instead of piping it. If you omit the instant pudding mix, then just mix the remaining frosting ingredients together until they’re fully incorporated—don’t beat them for a full 2 minutes! I’ve found freeze dried raspberries at Target and Trader Joe’s (these ones)! 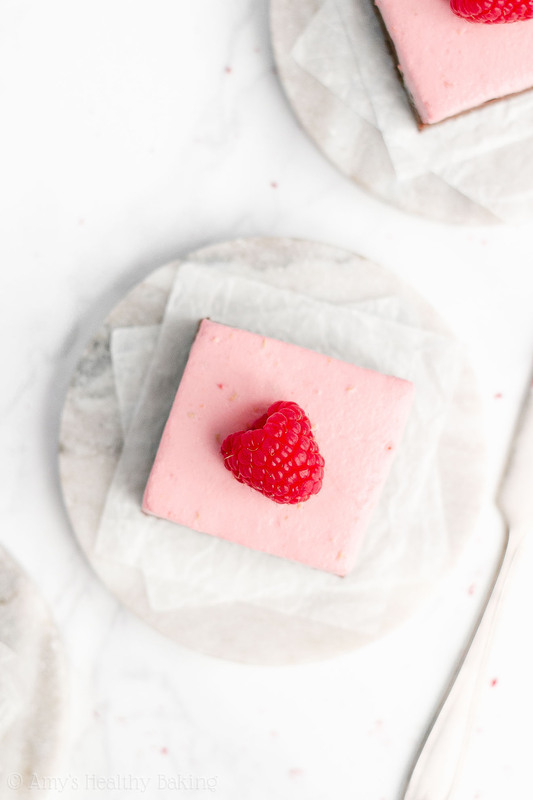 If you can’t find freeze dried raspberries, use this frosting recipe of mine instead. If you’re not a fan of stevia, then substitute the equivalent of 2-4 tablespoons of powdered sugar of your preferred granulated sweetener. (I like using 2-4 tablespoons of this confectioners’ style erythritol!) No maple syrup, honey, or agave—they make the frosting way too runny! For more tips and information, see the text of my blog post above!